2018 is a great year to think out of the box with your promotional trade show giveaways. You should look for a promotional product that’s unique, something that’s useful and will cause people to say, “Hey, that’s awesome! Where did you get that?”. Looking at promotional products for your next event can be time consuming, especially when you don’t have a large budget, but you want something that’s unique and memorable, something refreshing!” If you work in the marketing department of any company, no matter the niche, this conversation isn’t new to you. Every year, you and your team brainstorm new tactics and strategies to woo your customers. Every small detail, ranging from branding, to how the events will be held are important details as they can have a huge impact on your company. All this is done because it is essential to create a personality for your brand that sets you apart from the other competitors. And this can ultimately result in customers going with your company over the others. And that’s why it’s important to put just as much time and thought in the selection of your custom promotional products, so they resonate and are memorable to your target audience. When it comes to selecting promotional products, there is always a right and wrong way of doing things. There are many businesses out there who think that just purchasing custom hats, pens or any other random promo products and giving them away to people is all they need to do. But the chances of seeing benefits for your business are similar to that of throwing cake on the wall and waiting to see what sticks. Rather then selecting products blindly, it’s better to take a more strategic approach. 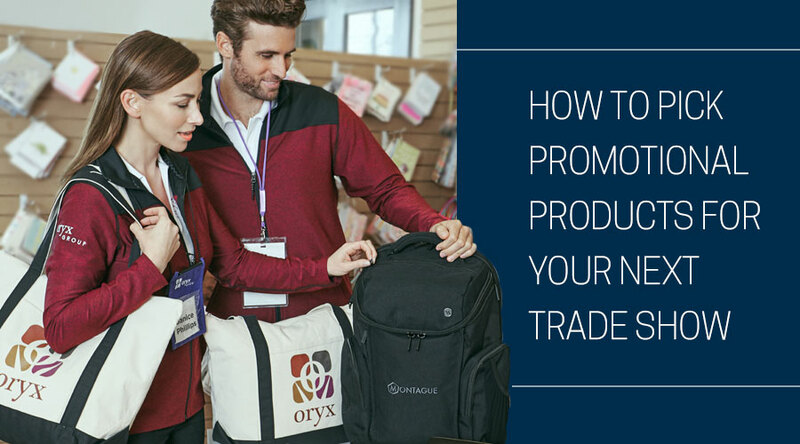 There are four aspects that should be kept in mind while picking the promotional products for your next big event. The bottom line of any marketing strategy is understanding the customers and their needs. Knowing your audience is the single most important aspect when selecting a promotional product. Demographics to consider include the gender, average age, industry and interests, their occupation along with their purchasing power are the factors that highly influence your product and services. In the same way, these factors also influence the choice of your promotional product. It is important to think about the kind of event you are hosting and the product that would perfectly complement the that event when choosing your promotional products. If your company has a booth at a convention, then custom tote bags or customized laptop bags are perfect as the attendees can easily carry the brochures and paperwork in the bags. Moreover, these bags are something that can be easily used on a daily basis after the event, so you receive more brand impressions. Longevity is another major factor that can influence the choice of promotional products. The main question is persistent you want your message to be? There are certain products such as custom t-shirts and tech items that remain with the recipient for a long time and expose your brand every time they are used. Whether you go for short term or long term, the bottom line is to keep your brand name etched in the minds of customers and have them relate your brand with an item that is creative and useful for years to come. Most of the time, promotional products are overlooked in spite of the importance they hold in which can make an event successful. It takes weeks of planning to find the perfect promotional products and customizing them with your brand. While we offer 24 hour rush delivery with certain products, we recommend you take time to research and consult with us before ordering. That being said, start your promotional product selection process at least 2 months in advance to give you ample time to receive your customized products well before the event and remove the stress that last minute planning will give you. Finding the perfect promotional products can be a daunting task, but we’re more than happy to help at iPromo in finding that next great giveaway or gift. So, what are you waiting for? Start browsing our collection of trade show promotional products right away.